Hall Of Fame Reverb gives you 10 reverb types and a custom TonePrint for a world of inspiration. The reverbs comprise Spring, Hall, Plate, Room, Church and Ambience; from a subtle reverb to a full blown cathedral. Hall Of Fame Reverb features Decay, Color and Level controls, which makes dialing in sounds quick and easy. 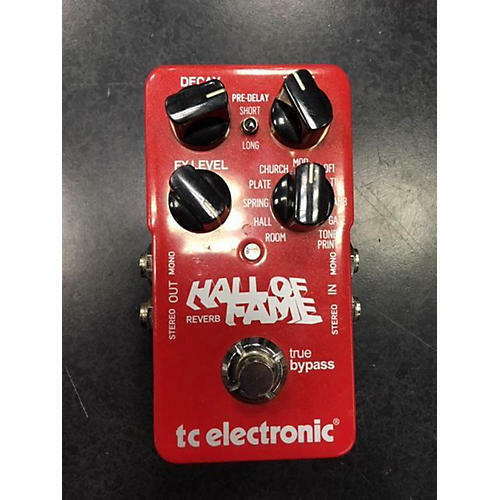 Hall Of Fame Reverb also has true bypass design, which ensures zero loss of tone when switched off, and features analog-dry-through which guarantees total tonal integrity of your dry sound, even with the pedal active. A small footprint, easy-access battery hatch, stereo in- and out and the highest-grade components complete this awesome reverb pedal..